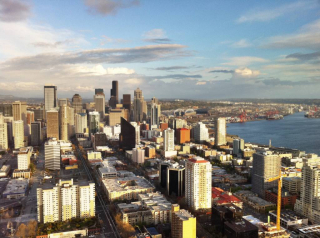 Downtown Seattle is home to many highrises and condominiums with wonderful views of Elliott Bay, Puget Sound, the Olympic Mountains, the Space Needle, Lake Union and Mt. Rainier. Amenities in the area include the new public library, Benaroya Hall, Pike Place Market, the Seattle Art Museum (SAM), Pioneer Square, restaurants, theaters, galleries and shops, including the city’s biggest retail stores. Downtown Seattle, Pioneer Square, Belltown and Denny Blaine all make up the downtown corridor offering myriad of housing options from tiny studios to luxury penthouses. As of March 6, 2013 the lowest priced condominium downtown is a studio listed at $135,000 and the highest is $8,000,000 — an entire top floor penthouse on the 20th floor with 360 degree views. Of the condominium homes currently on market, the Median List Price is price is $692,000 and the Median List to Sale Price Ratio is 99.3%.